Don't get cold feet! 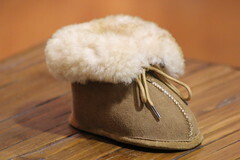 Plunge into high-cuffed sheepskin luxury with a pair of our cozy Ladies Booties sheepskin slipper. Our most popular ladies slipper, the deep, thick cushion of real sheepskin will insulate your feet at your own perfect body temperature, and the cuff can be flipped up for extra ankle warmth. The flexible and weatherproof TPR sole allows you the freedom to run out and get the mail. Quality detailing inside and out provide functional durability and satisfying warmth. Genuine Sheepskin Lining/Cow suede leather upper.